With mediated performance (live performance using digital video technology), increasingly commonplace in 21st century theatre, what changes in the relationship between actor and audience? Ciaran’s research focuses on what impact these technological developments have had on the relationship between actor and audience, and how the presence of surfaces, image and video in live theatre might change the perceived “connection” between performers and spectators. 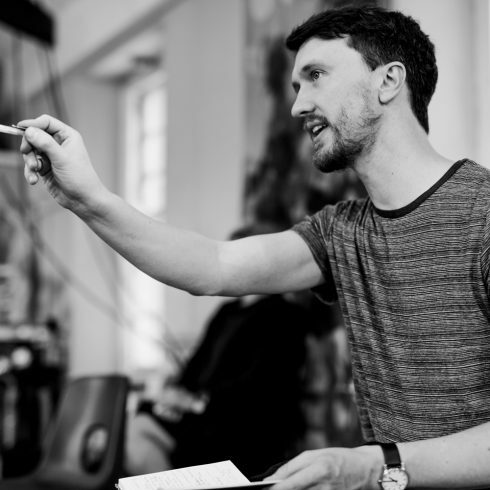 Ciaran is a researcher and theatre practitioner, he has worked as a collaborator on several digital theatre projects from his base in Cornwall. These include a livestreamed Waiting for Godot, and interconnected version of The Tempest (both with Miracle Theatre), and Ultraorbism, a simultaneous performance between Falmouth and Barcelona with artist Marcel·lí Antúnez Roca. His work sees him playing at the interface between theatre, television and film, using emergent technologies to create televisual environments in unfamiliar stage spaces.